Calling all who want to trade Sidney Crosby: we might just want to keep him around. On Sunday, Crosby had the ultimate revenge on Alexander Ovechkin and the Washington Capitals, notching a goal, assist, and the game's only shootout goal in a 4-3 Penguins victory. The win concludes the first 5-0 road trip in franchise history and runs Disco Dan Bylsma's record to an unreal 8-1-1 since replacing Michel Therrien on February 15. As displayed on Sunday, Crosby seems to have developed an instant chemistry with new linemates Bill Guerin and Chris Kunitz, who combined for a goal and three assists in the victory. Once again, Ray Shero's deadline moves seem to have scratched exactly where the Penguins itched. Marc-Andre Fleury also came up yuuuuuuge in the win, stopping all three Capital shooters (including Ovechkin) in the shootout and stonewalling a number of key shots in regulation and OT. MAF, who at one point this season had lost six of seven, has won eight of his last nine contests and has been a key component in the Penguins' recent resurgence. More than any other indvidual suiting up on Sunday, this game was about Crosby, who surely felt he had something to prove after being outplayed and somewhat shown up by Ovechkin in the last meeting. Sid smartly kept his cool, avoided any major incidents, and played his game in reminding the hockey world what Sidney Crosby is all about. 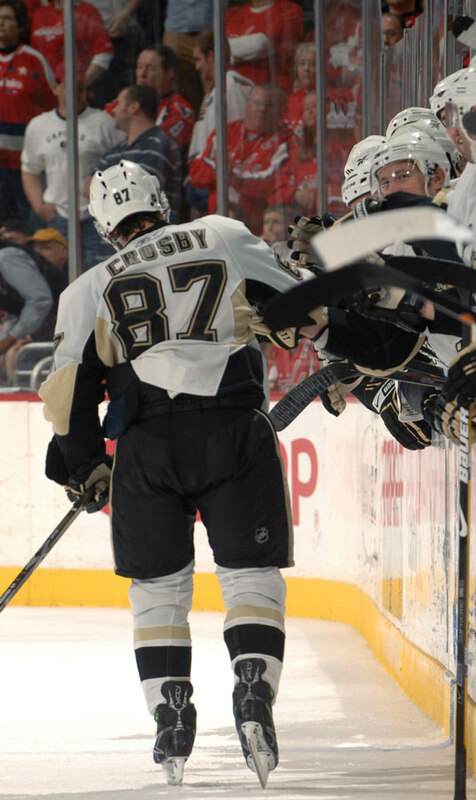 Yes, Ovechkin did score a goal, but in crunch time it was Crosby who delivered when his team truly needed it. 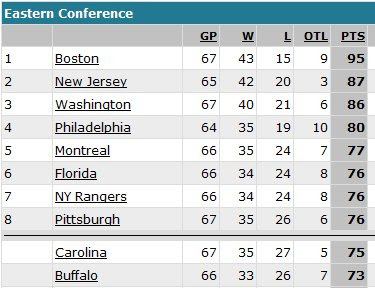 The Pens' schedule picks up with an actual home game against Florida on Tuesday, where they will probably get a nice reception/10-minute standing ovation. While the road wins are nice, there's nothing wrong with taking one at home, either. I have no problem keeping Crosby forever, but if we're in the same situation to start next season as we were this one, meaning; no winger for Crosby, then I'll logically have to think the team could be better served by a player, or more likely 'players' not as needy. If Shero can't find the right player, he better have a plan to keep Guerin around until he does. Nice win by the way. Notice how Ovechkin didn't poop his pants celebrating like he won the lottery this time. He almost looked like a real hockey player out there and not a soccer player. Then again, maybe he was too tired after all the backchecking he didn't do. It's tiring just floating around center ice the entire game cherry picking and looking for cheap hits. Funny- Fleury seems to get real hot after Whitney was shipped-coincidence? His -15 is not missed. Rege - No coincidence at all. Although, Letang was doing his best yesterday to remind us why we won't miss Whitney more that say...Josef Melichar or Noah Welch. I mean, if we wind up feeling nostalgic for someone to cough up the puck at the blueline we still have Goligoski, right?